In the marketing world today, we talk a lot about technologies and tactics to deliver a more personalized message, on the right platform, at the right time. Conversations range from the effective uses of targeted social media messaging to hyper-personalization using first-party data. It’s a lot. And we spend a lot of time and effort figuring the technology and targeting sides out—as we should, because personalization tools and strategies are crucial. In order to transform the process, we first have to start by understanding the pain points between the teams forming media and messaging strategy and the teams building and executing the creative. There isn’t sufficient explanation and training for creative teams on new targeting strategies and personalization tools. What takes months (and sometimes even years) to choose tools and develop strategies is explained to teams in one-hour discovery sessions. There is typically a significant physical disconnect between creative teams and strategy/activation teams, which makes the natural cross-pollination of ideas difficult. Because of targeting and personalization, more creative iterations are needed, but budgets and timelines aren’t changing. If they are, they are getting smaller and shorter. Early in the process of choosing a new personalization tool and planning a personalization strategy, it is critical to have a creative lead involved to weigh-in on the implications from their department. Great creatives are deeply strategic. Bring them in early, and they will ask great questions and bring a different perspective. Those choosing new technology tools and planning personalization strategy must fully educate the creative team that is going to be working on it. Show them the technology, explain the strategy, and connect them to other teams who have implemented similar projects. For example, if you are working with a new technology, introduce the creative team to the vendor team. Oftentimes, vendors will have connections to other clients who have done projects of similar scope. Traditional creative briefs need to be adapted to infuse a more in-depth look at the various audience segments, platforms, and creative iterations needed. Additionally, include how the audience is going to be targeted and what data is being used. Explain the cadence of the content and if there are any sequential delivery implications. It is your job to give the creative team what they need to get the job done. While process is important, it’s not our job as strategists to tell the creatives how to get the work done. Be super specific on what you need, discuss a healthy timeline to secure drafts, identify touchpoints along the way, and then politely get the heck out of the way. For those of you in and around the Houston area, I’ll be talking about this topic at the Houston Interactive Strategies Conference on Thursday, October 20, 2017. 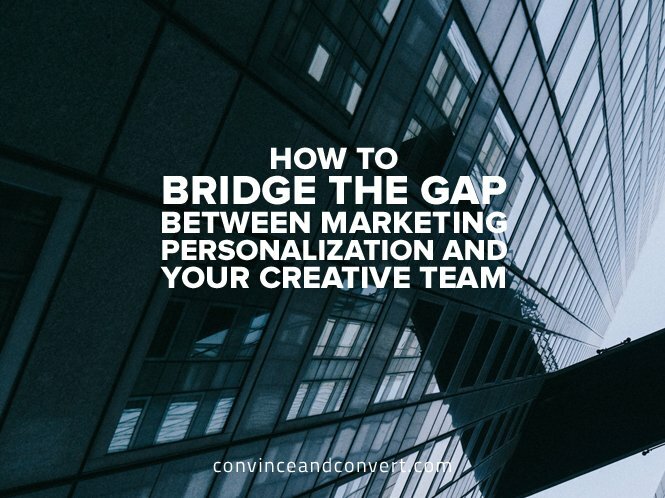 I would love for you to join us for a more in-depth look at specific process steps and tools to bridge the gap between personalization and creative.